Ambassador John Ashe, of Antigua and Barbuda, the President of the General Assembly 68th session, speaks during a news conference at United Nations headquarters. A former president of the United Nations General Assembly and five others, including a billionaire real estate developer from the Chinese territory of Macau, are accused of participating in a bribery and corruption scheme, U.S. prosecutors say. 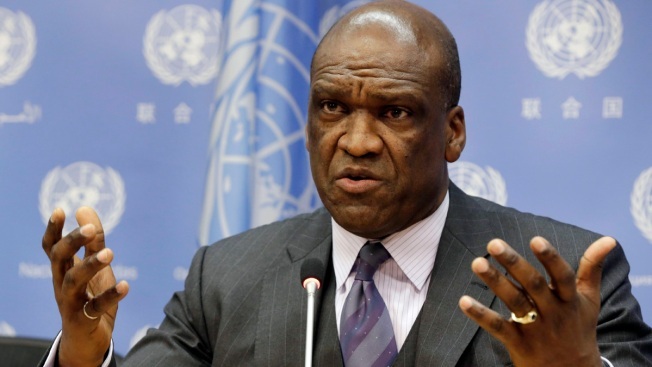 John Ashe, the former Permanent Representative of Antigua to the U.N. and former president of the U.N. General Assembly, is accused in a five-count federal criminal complaint ofh accepting hundreds of thousands of dollars in bribes from Chinese billionaire NG Lap Seng and others in return for Ashe’s help with a real estate deal in Macau, prosecutors say. U.S. Attorney Preet Bharara repeatedly noted that it was early in the investigation and told reporters that as it proceeds: "We will be asking: Is bribery business as usual at the U.N.?" He added: "I wouldn't be surprised if we see other people charged." Prosecutors say Ashe "converted the United Nations into a platform for profit" and would use bribe money to pay for personal expenses including family vacations and construction of a basketball court at his home in Dobbs Ferry. "We obviously just learned of the very serious allegations this morning," Stephane Dujarric, spokesman for U.N. Secretary-General Ban Ki-moon, told reporters. Dujarric said Ki-moon was "shocked and deeply troubled" by the allegations that "go to the heart and integrity of the U.N."
Ashe and three others were arrested by FBI agents early Tuesday, law enforcement officials said. Those charged in the criminal complaint unsealed Tuesday in Manhattan federal court included Seng, who was arrested two weeks ago along with his chief assistant, Jeff C. Yin, 29, a U.S. citizen whose bail was revoked last week over allegations that he lied to investigators after his arrest. Lawyers for Ng, Yin and Lorenzo, 48, did not immediately respond to requests for comment. It was not immediately clear who would represent Ashe at an initial court appearance Tuesday. A message for comment left at Lorenzo's mission was also not immediately returned. Diego Rodriguez, head of the FBI's New York office, said the charges should be a warning "to those who come to the United States from other countries with corruption plans or bags full of cash." According to court papers, the 61-year-old Ashe used his U.N. positions to support a multibillion-dollar U.N.-sponsored conference center that Ng hoped to build as his legacy in Macau, where he lived, and to help Ng meet government officials from Antigua. Prosecutors said the conference center would function as a sort of satellite operation for the world body. Ng and his assistant had been held by federal authorities on charges they lied about plans for $4.5 million in cash brought into the U.S. over several years aboard private jets. Other money, they said, was used to lease a luxury car, pay his home mortgage, buy Rolex watches and custom suits, and construct a $30,000 basketball court at his home in Dobbs Ferry, New York, where he was arrested Tuesday. He opened two bank accounts to receive the funds and then underreported his income by more than $1.2 million, officials said. No one answered a phone call to the mission for Antigua; Ashe is no longer listed in the U.N. directory. A message left with a representative for the General Assembly wasn't immediately returned. Prosecutors said two other arrested individuals were involved with Ng. They were identified as Sheri Yan, 57, and Heidi Park, 52, both naturalized U.S. citizens who reside in China and helped facilitate the scheme, prosecutors said. It wasn't clear who was representing them.